Deoxys was in my personal list because of its Psychic attack that costs CC and being a Psychic typing. It fills in the void after Mewtwo EVO rotated out. As long as Psychic weak Pokemon continue to see play, Deoxys can step in to lay the hurt. I suppose right now it can prey Malamar and Buzzwole (GX or not) for weakness. And it’s retreat cost of one can be cleared with Escape Board (or Skyarrow Bridge in Expanded). It also gets support with Malamar with Psychic Recharge so that you can use Power Blast turn after turn, making the discard inconsequential. This makes Mewtwo-EX (BW Next Destines) obsolete as Deoxys is worth a single prize. Deoxys (CES 67) returns to the Standard meta in the Celestial Storm expansion set. This card was much heralded as the successor to Mewtwo (EVO 51) as an anti-Buzzwole GX counter… only the giant mosquito has fallen off the face of the meta. Baby Buzzwole was the second most common Pokemon among the top finishing decks of the first four tournaments of the new season, seeing play in 73 out of 189 lists (39%) with an average of 2.6 cards per list. Big Daddy Buzz, however, was only played in 16 out of 189 lists (8%), and lists that carried the GX Protein Shake only averaged two copies per decklist. How the mighty have fallen! This Deoxys has two attacks. As mentioned above, Deoxys has the exact same attack as Mewtwo EVO (including the name), but it also has an additional attack Power Blast that does 120 damage for two Psychic and a Colorless energy but forces you to discard an energy after attacking. It can still fill in as Buzzwole GX’s arch enemy, but it just doesn’t have the same demand as Mewtwo EVO did before rotation. 25 out of the 189 top finishing lists carried it (13%), and those that did employ Deoxys averaged 1.6 copies per list. It can also function to counter Baby Buzz (although is fifty short of an OHKO if the non GX Buzz only has a single energy attached), and I see Psychic weak Pokemon in almost twenty (19.4) percent of my matches on PTCGO, so Deoxys might just be a good tech in a lot of decks. I’ve seen Deoxys four times on PTCGO and split 2 W 2 L in those matches. If you have trouble against Psychic weak Pokemon, you might want to consider adding one or two of these to your sixty cards. 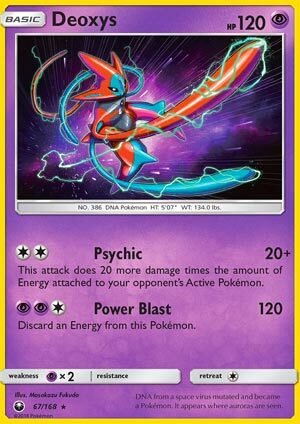 Deoxys (SM – Celestial Storm 67/168) is one of THREE different Deoxys cards in SM – Celestial Storm, but the only one to get nominated for our Top 10 list was this one. We’ve actually been running through the runners-up from both our two most recent countdowns the last few weeks worth of reviews, but I wanted to mention it with Deoxys because I’m thinking it should have made the list a bit higher. Deoxys honestly was one of the “safe bet” cards, so I’ve no excuse for why it didn’t make my personal Top 25. It is a [P] Type Basic Pokémon with 120 HP, [P] Weakness, no Resistance, Retreat Cost [C], and two attacks. For [CC] it can use “Psychic” to do 20 plus another 20 for each Energy attached to your opponent’s Active while for [PPC] “Power Blast” lets it do 120 damage, though you’ve also got to discard an Energy from itself as an effect of the attack. So, how does all of that come together to make me regret it not finishing higher? Well, part of that is external; while I’m happy that some of the cards, like Magcargo (SM – Celestial Storm 24/168) are finally seeing enough play that I can stop worrying I blew it completely with my own list, and a few others like Articuno-GX finally have found a niche I didn’t predict after our review of it (its GX-attack in a stall deck, for the record), several others have me worried. What is internal, at least ignoring that no card is being played by itself in this game, is how Deoxys has the HP, Retreat Cost, and attacks to replace not one but two different Basic [P] Type attackers: Mewtwo (XY – Evolutions 51/108) and Mewtwo (SM – Black Star Promos SM77). Mewtwo (XY – Evolutions 51/108) proved itself a solid [P] attacker to splash into a variety of decks. This was because it had the exact same Psychic attack we see on this Deoxys. Going into a little more detail, it has 10 more HP than Deoxys, but its Retreat Cost is [C] higher, so that seems like a fair trade to fill the same role, especially now that we lack Float Stone but still have Escape Board. Though Mewtwo (XY – Evolutions 51/108) also knew “Barrier”, which was a decent enough stall attack, you couldn’t use Barrier twice in a row without using Pokémon Ranger, and its [PP] cost rarely worked for most decks. Now, what about Mewtwo (SM – Black Star Promos SM77)? It also has 120 HP, though it still has the chunkier [CC] Retreat Cost of Mewtwo (XY – Evolutions 51/108). Mewtwo (SM – Black Star Promos SM77) does NOT have a splashable attack, but has a useful Ability called “Pressure”. Pressure only works while a Pokémon with the Ability is Active – Mewtwo (SM – Black Star Promos SM77) isn’t the first to have it – and it provides -20 damage reduction to the attacks of your opponent’s Active. This means any Bench hits that do 10 or 20 damage do nothing, in addition to making Mewtwo (SM – Black Star Promos SM77) itself a bit more durable. Pressure isn’t the main reason Mewtwo (SM – Black Star Promos SM77) had been seeing competitive success until recently, however; it was one of the better single-Prize attackers you’d find in Malamar (SM – Forbidden Light 51/131; SM – Black Star Promos SM117) decks. For [PPP] it could use “Super Psy Bolt” for a reliable 100 damage. Which brings us back to Deoxys, which can do 120 for a similar Energy cost with its Power Blast attack. Due to Malamar decks running on only or almost only basic Psychic Energy, the fact that Power Blast has a slightly more flexible Energy price but discards an Energy from itself won’t often matter… and based on the Pennsylvania, Offenbach, and Tennessee Regionals it looks like Pressure isn’t worth it hitting for 20 less damage. So, all of this easily qualifies Deoxys for use in Standard and Expanded Format play, and thanks to the mostly [C] Energy costs while being a “big Basic” Pokémon, it is an absolute beast (just not an Ultra Beast) in the Limited Format as well! I wouldn’t, but I suppose you could even risk running it in a +39 build. The future, however, isn’t as bright; I haven’t seen anything that will replace it for when you need to splash in a [P] Type attacker, but there’s a new Giratina that seems to have replaced completely in Malamar decks. If you haven’t already, give Deoxys a shot in your Malamar decks, as well as any deck that can easily pay the [CC] cost of Psychic if you need to punish [P] Weak, Energy-laden opposing Pokémon. It is a bit annoying that something like Buzzwole survives even if it has two Energy attached to it, but you take what you can get. Just be aware that as Deoxys replaced another [P] Type attacker, an upcoming [P] Type attacker is likely to soon replace Deoxys.